← Are Taxes too High? Have you heard of Peter Schiff? He runs an unusual brokerage company called Euro Pacific Capital which can get you investments you can’t get into elsewhere, like Australian stocks/CDs and physical gold. He is someone widely derided by the conventional financial gurus as being too doomsday about the U.S. economy. Yet he has been right about the 2008 economic collapse and right about recommending dumping the dollar and buying gold. 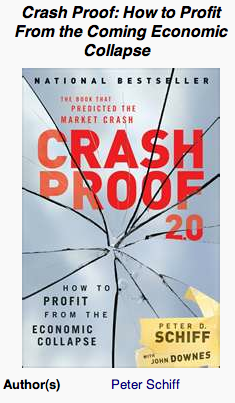 I think his book, Crash Proof, published in 2007 was dead on and he diagnoses with uncanny insight. Peter Schiff is warning of an upcoming dollar collapse and severe distress in the Treasury market. In his periodic video blogs he has been harping on his themes with data and analysis to back himself up. His latest video blog is worth watching. See here. Ironically, people rushed out of stocks and into treasuries, after the downgrade. The dumb money fled to treasuries (at an insane 2% return for a 10-year note) and the smart money fled to gold. Gold is like a thermometer which gives the temperature of the patient (in this case the US economy). At $1600/ ounce it was telling us that the patient has 106 degree fever. No doctor trying to treat a patient can ignore this vital sign. It is telling us of a dire condition that is being under appreciated. The patient has now got sicker as gold is selling at over $1800/ounce. Maybe it’s time for the cautious and those who must protect against short (perhaps short term) distress to take heed and get some protection in the form of stable currencies (Australian, Canadian and Swiss) and gold. His brokerage can do so, but a lesser solution is to do it via iShares ETF’s.